Open a Betfair account here and try this strategy for yourself. 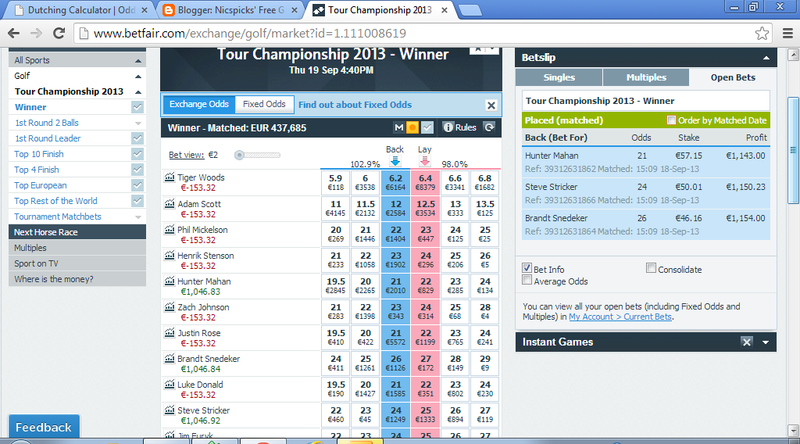 If you don't fancy backing anyone EW in the 30 man Tour championship field, trading the event is a good alternative. 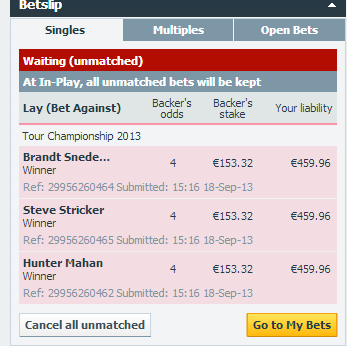 I'm going to outline a pretty simple trading strategy I use in this type of scenario: Basically I'm going to dutch (split my total outlay/stakes on all my selections so that each would return the same amount if 1 of them won) my three selections of Snedeker(26.0); Mahan(21.0); Stricker (24.0) for a total outlay of €153.32 (see screenshot - click to enlarge). I'm now going to target odds of 4.0 and place an order to lay back my whole €153.52 on each of the three players. Should either Snedeker, Mahan or Stricker then hit these odds of 4.0 in-running, my lay bet will be matched and my whole tournament investment will be covered for a freeroll. Please note that all three may fail to hit these odds.